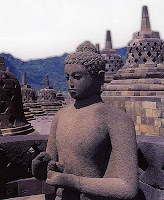 Central Java an ancient land of terraced rice paddies and spectacular mountains which has seen the rise and fall of mighty empires, the construction of some of the world’s most ambitious and awe-inspiring temples, and the most sophisticated of Java’s arts and culture. Here too, is an agrarian society scarcely changed in centuries, with bamboo villages and mountain slopes sculpted into rice terraces by generations of farmers. Brooding volcanoes and verdant rice fields. Regal splendor and captivating dance. An endless tropical garden on the shore of an azure sea. These are the romantic depictions by generations of writers who have visited the island of Java. These impressions are also accurate. Java is an incredible mosaic of sights, sounds and impressions: a pleasurable form of sensory overload. The largest man-made object in the Southern Hemisphere, the massive Buddhist temple of Borobudur, the eerie temple complex on the Dieng Plateau and the more than 50 Hindu and Buddhist temples scattered over the Prambanan Plain draw visitors from all over the world. But central Java’s attraction lies not only in dead stone. The great traditional art forms: court dance, gamelan music and wayang shadow puppetry, are as vibrant now in the cities of Yogyakarta and Surakarta as in centuries past. The gamelan bronze gong orchestra is as much a part of Java as rice fields and volcanoes. An ancient, sophisticated and complex musical form, the gamelan accompanies every ceremonial occasion, from the coronation of the Sultan to the arrival of a tourist group in a hotel lobby. And no art form captures the essence of Java better than the wayang, the shadow puppet theatre which summons forth omniscient gods, heavenly nymphs, monstrous ogres, noble kings and skillful warriors, in a magical, flickering display. Although the modern world has come to Java, bringing with it efficient transportation and comfortable accommodation, it has not conquered the Garden of the East. A few steps away from any hotel lies all the charm and enchantment of a profoundly exotic land and culture. A journey to Central Java can be the trip of a lifetime; more than a feast for the eyes, it is food for the soul.